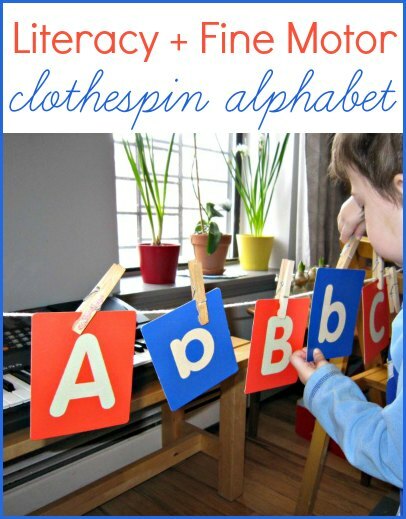 Clothespins are a great fine motor activity for kids and combining it with the alphabet adds a literacy twist. This is a super simple activity to set up and keeps the kids busy, which all parents need! 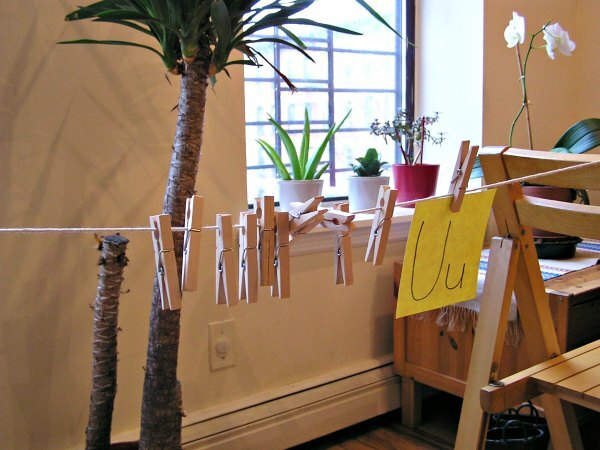 I tied a string between two chairs in the living room and handed Kiddo a set of homemade alphabet letters (just a bit of construction paper and a marker is all you need). He practiced his pincer grip by hanging up the alphabet in order (sort of). It was a bit of a challenge for him sometimes but we worked together and he found it great fun. He especially liked removing everything from the string!!! It was super quick entertainment and just the kind of indoor activity we needed to distract us on a cold afternoon. Maybe next time he’ll hang up the laundry! Update: Nearly 5 years later, Kiddo’s brother is up to the same old tricks, but this time we used our fancy-dancy sandpaper alphabet cards and he matched lowercase and uppercase letters. I think this might help us with our sight word review. Thanks for the idea! Thank you so much for sharing this activity idea. May I add a teensy tip please? I have threaded the string through the spring part of the clothes peg (uk version of clothes pin) which keeps the pegs strung so that our boys only need to attach the letter without needing to worry about also pinning the string. Threading the clothes pegs whilst they were attached to the packaging cardboard strip that they were bought in meant that they were all kept still and was easier than threading them individually.